How do I deepen my faith? Why not come along to an informal group and explore questions you would love to raise? • What is faith and how can I find it? • Why do we pray and how do we do it? • Why do we go to church? Women can now be bishops. Hooray!! Finally!! I think this change is vital for the Church of England for many reasons, but mostly because I believe that good leadership is imperative for every organisation. This belief has been deeply rooted in me from the time when I started my engineering apprenticeship back in 1988. I was pretty naïve, my school was an all-girls school and I had no idea that women weren’t meant to be good at engineering! Furthermore, the sexual harassment and distrust of women on the shop floor astonished and frightened me. The managing director had a different view to the lads on the shop floor. He said that the company was in a very competitive market. For the company to survive he needed the very best people working for him, in particular the very best leaders. He didn’t care whether they were black, white, pink or green, whether they were male or female, short or tall, gay or straight. He had to have the very best, otherwise his competitors would employ the best and then they would prevail. This pep talk enabled me to walk tall for all the years that people told me that women couldn’t be engineers “judge me on my work, not my gender” would be my reply. Furthermore, I watched to see whether the managing director’s theory was true – that organisations that practised prejudice failed and those who enabled everyone to use their gifts succeeded. Over the years I have become aware both of how arduous it is to lead well and also how few people have this gift. I also became aware of how important good leadership is, I have been very blessed by working alongside amazing leaders who have helped me no end. I have also experienced times of working with terrible leaders and I believe that the damage that they do is significant. It is my opinion that God gives each of us gifts, and leadership is a gift that God gives to some, whilst others are fantastic researchers or great team-builders or brilliant ideas people. Every gift is vital for the building up of God’s church and God’s world and should be received with joy. Sadly, I think that we have wasted the gifts of many in the church by excluding then and this has left the Church of England impoverished. I don’t want to see women bishops per se – I want to see great bishops. Great female bishops, awesome gay bishops, inspiring disabled bishops, bishops of all races, genders, sexualities, disabilities and from different backgrounds. Only then do I believe that we will be fully receiving the gifts God showers on the church. I’m looking forward to the riches that we are going to discover. We had a really good year last year with Sunday School – there is a good core now and we seem to be getting more new members. Plus additional members of the congregation have been helping and the children are becoming more and more part of the congregation. We have planned the next year and these are the dates. On 1st June we had a Vision Day at St John’s Church, led by Steve Cox who is the Local Mission Adviser from the Diocesan Parish Development and Evangelism Team. Although St John’s has grown 10% in the 2012 and a further 13% in the year 2013, growth was high on the agenda for those who attended, who feel that the congregation that does not include people of all ages and hence we feel we are not fulfilling our calling to be inclusive to everyone. At the Vision Day families, children and young people were highest on our list of people we would like to serve better, however we felt that there may be that there are others that we are not including too. We discussed that it may be that the 9:30am service needs to change, or perhaps 9:30am on a Sunday is not a great time for families and a new service needs to start. 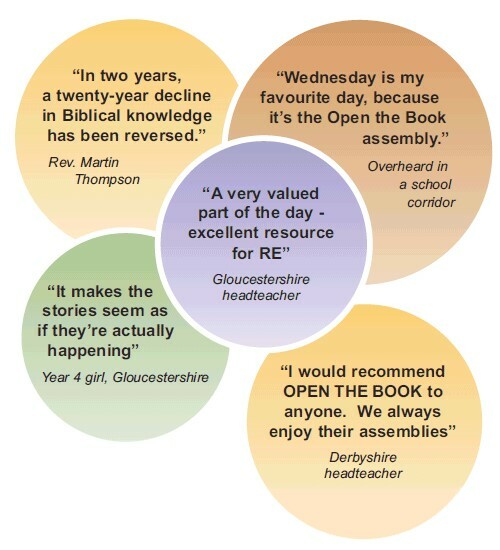 This year we are going to do something new for assemblies in Folly Hill School and Badshot Lea Village School – we are using a resource called “Open the Book”. OPEN THE BOOK offers primary school children an opportunity to hear the major stories of the Bible in an interactive and enjoyable way during assembly times. Teams of Christians from local churches tell the stories in a 10-15 minute presentation. This can be incorporated into a wider school assembly, or stand alone. All the Year One stories are taken from The Lion Storyteller Bible written by Bob Hartman, and give an overview of the Bible from Creation to the Ascension. OPEN THE BOOK fulfils OFSTED requirements for Collective Worship. We are hoping that this will be an ecumenical endeavour with all the local churches involved. So far we have done the training and it has been both tremendous fun and also helped us understand the Bible Stories in different and deeper ways. If you would like to know more, please email me – revdlesley@gmail.com. On Monday 22nd September at 9:30am at St Mark’s Church, Alma Lane, GU9 0LT, Suzette Jones the Diocesan Health and Wellbeing Advisor will be leading a Mindfulness Taster Session. Mindfulness simply means paying attention to our experience in the present moment, on purpose and with an attitude of kindly acceptance. It is a technique that helps us be in the moment and it can be of particular benefit when we are feeling stressed or anxious. Swoosh, clitter clatter – that’s the sound the seed makes when it falls on the path. Then there was a flapping of wings, a pecking and a squawking. but I must have been mistaken. there’s no seed on the path now. Oh, look, there will be good blackberries this year, but mind the thorns, nothing else can grow in that dense thicket. Yes, I’m listening! I’m doing my best. – the bit where the disciples question Jesus as to why he talked in parables, in riddles. then we’d all know what he was trying to say. so he explained the parable to them. they questioned and they were answered. why is it that sometimes we still don’t get it? and it’s nothing to beat ourselves up about. It could be that we don’t speak the language. but sometimes someone would say something totally incomprehensible to me. Even when repeated, still I couldn’t make it out. I wonder what the very first people thought when they heard Jesus tell the parable of the sower? Well, I suppose they might have wondered why any sower would waste so much good seed. Talk to me about fish, then I’ll listen. God, the sower, is just wasting his time. OK, some won’t ever bear fruit. There too many distractions we mean to do God’s will, but we are easily distracted. Someone has a better plan – let’s go out this evening, let’s have fun, it’ll be OK.
And now we are listening. it’s great for a while. our roots aren’t that strong. As God keeps sowing more seed, perhaps this time it will find good, fertile soil. so what does it all mean for us today? one has dramatically affected me. My call to serve God has taken me away from St Georges for a while and I miss you – I will be back now and then. But a seed was sown. what is special to us. God has made us each different. Unique. Within each of us at any time, there is a variety soil which will be fruitful or not. It’s just one of those things. Our parish has something really special, an inner core of prayerfulness, joy and peace. Our parish is outward looking and welcoming to all. Our congregation are loyal, generous, hardworking people who come together and share God’s love. What is God sowing within us? In fact we are all doing everything we can. 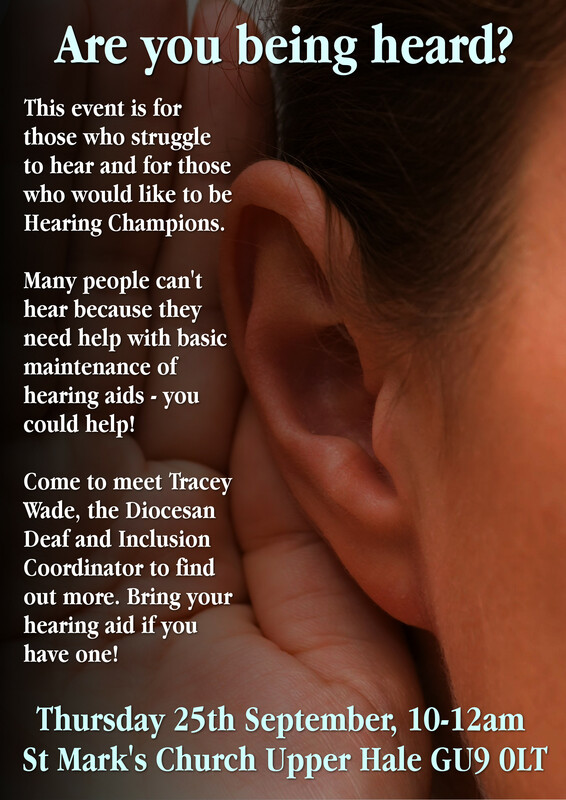 1 in 6 people have a hearing loss in our Diocese. An increasing older population and longer life expectancy, mean that our church buildings need to be able to welcome and accommodate those with sensory loss to aid communication.